Pictured with John Hilton (2nd right) are Mike Ritchie (2nd left), Mike's son Michael & his daughter Kimberley. 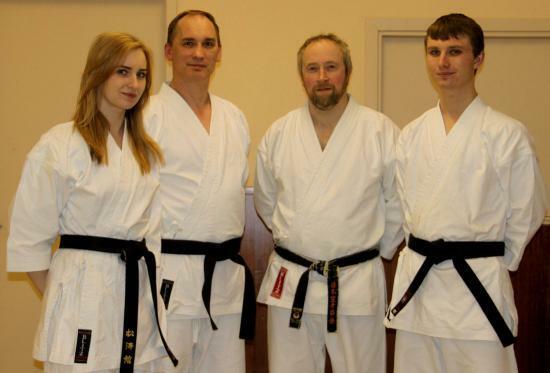 This family trio have all achieved the grade of 2nd Dan black belt in Shotokan karate. Michael passed his cadet 2nd Dan grading in 2009 (aged 17). Mike & Kimberley passed their senior 2nd Dan grading in September 2011. All three of them attended an international karate course hosted by Sensei Kawasoe (head of the United Kingdom Traditional Karate Federation) in Edinburgh in September where Mike & Kim passed a three part examination that tests their basic karate techniques (Kihon), their performance of a predetermined set of moves (Kata) and (under strict control) free sparing (Kumite). They are all members of the Thurso Tora-kai Karate club, although Kim also trains in Edinburgh where she is studying at University. Mike and Michael are now instructors in the club, along with John Hilton and Charlie McIntosh (both senior 2nd Dan black belt), which has been running for over 28 years and has seen well over 200 students gain skills, fitness and confidence from Karate instruction and training. The club train twice a week; Monday's in the Royal British Legion hall and Thursday's at Mount Pleasant primary school, both nights from 6pm to 7pm. If anyone would like to join the club or just "come and try it" you will be made most welcome. Health, fitness and fun for all ages (6 years and up). For further details contact John Hilton on Thurso 894286. For training times etc of the Wick Tora-kai Karate club, contact Michael Tait on Wick 605865. Highlights of the recent Wick Tora Kai Kata & Kumite Competition. The club will be celebrating it's 30 year anniversary next year..
On Saturday 6th April 2013, Karate students from across the County took part in the clubs annual Kata & Kumite Competition in Wick Assembly Rooms. Competitors ranged in ages and grades from 6 year old beginners to adult brown and black belts. Kick start your New Year with a fitness programme with a difference. Wick Tora-Kai Karate Club is now running Beginners Classes for all ages 12 and upwards every Monday night at 7.00 pm in the Assembly Rooms. Some of the senior members of Caithness Tora-Kai karate club recently attended the International Traditional Karate Federation summer course at Heriot Watt University in Edinburgh. This annual event has been attended by Caithness exponents for the past 20 years.